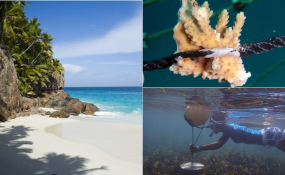 The Seychelles is looking to invest heavily in its blue economy. Michel's appointment was announced on the sidelines of the 'Our Ocean Conference' in Bali, Indonesia, according to a communiqué from the James Michel Foundation. "I have devoted much of my life to marshal a new era of sustainability and prosperity for our oceans by championing causes such as the Blue Economy and marine protected areas. The Blue Economy is not simply about making greater use of the sea, or more commercial fishing, but about making better use of it. In this economy, the sustainability of ocean resources is recognised as critical to global economic growth," he said. The co-president of the Bertarelli Legacy, Dona Bertarelli, said, "The ambassadors are committed to promoting marine conservation, especially large-scale Marine Protected Areas and are global leaders who have demonstrated their commitment to protecting the ocean." The other members of Pew Bertarelli Ocean Ambassadors are former US Secretary of State John Kerry; former UK Prime Minister David Cameron; former Minister of Foreign Affairs for Chile Heraldo Muñoz; and former Senator from Guam Carlotta Leon Guerrero.